Rock Newman was one of the boxing’s biggest promoters for more than three decades. He explains to The Undefeated’s Mark W. Wright why he no longer cares for the sport. I really don’t like boxing anymore. Some people might be surprised to hear that — particularly since Rock Newman’s name, for some, is synonymous with the sport. But this detachment didn’t happen overnight. It was a long, arduous, angst-inducing process that really started shortly after the political shenanigans and malfeasance in boxing became so obvious. Even though I was on top of the boxing world – managing and promoting one of the most charismatic and talented fighters of his generation in Riddick Bowe, ruling the roost and being influential and as powerful as anybody in the sport, my distaste for the sport was there – and I couldn’t kid myself about that. As the years passed, I knew I had a commitment to represent Riddick Bowe to the best of my ability, but during that whole time I felt like I was doing it in a business that was a cesspool of corruption. I remember 60 Minutes did a piece on me, and Mike Wallace said to me: ‘You’re Rock Newman; you’re going to clean up boxing.’ I took a long, pregnant pause and said, ‘I don’t know if I can clean up boxing, but I’m not going to allow boxing to dirty me.’ That’s precisely how I felt. 1993 was a great year. Riddick Bowe owned the heavyweight championship of the world – after taking it from Evander Holyfield that previous November. We were on top of the world. You have to remember I was no rookie in the boxing game. I had been in the business, at that time, since 1982, in a significant way. And I can tell you, with absolute certainty, that titles changed hands or didn’t change hands – not as a result as what happened in the ring – but from what happened in dark rooms. I can tell you that with absolute certainty. And, so, I was still in the business – knowing some of the filth – having been a firsthand witness to it. 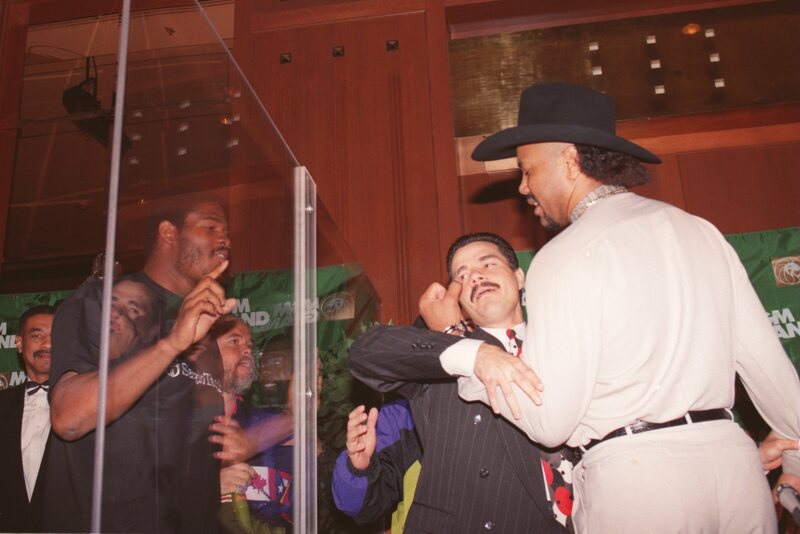 8 JUN 1995: JORGE LUIS GONZALEZ (RIGHT) IS RESTRAINED BY MANAGER LUIS DECUBAS WHILE RIDDICK BOWE (LEFT, POINTING) AND HIS MANAGER ROCK NEWMAN LOOK THROUGH THE GLASS PARTITION THAT SEPARATED THE TWO FIGHTERS DURING A PRESS CONFERENCE IN LOS ANGELES PROMOTIN THEIR UPCOMING JUNE 17 FIGHT AT THE MGM GRAND IN LAS VEGAS. That reign on top of the mountain was not long, and I strongly encouraged Bowe to retire in 1996, and was happy when he finally agreed to do so. I remember going on Fox News with Bill O’Reilly after the Lennox Lewis-Evander Holyfield fight at Madison Square Garden on March 13, 1999, which was declared a draw when it should have been a landslide victory for Lewis. I remember saying then that when athletes compete and one fighter wins but can’t get the victory, then the sport shouldn’t be allowed to continue. I had a real strong feeling that boxing should be abolished. I reached a personal boiling point after watching what some people call one of the great fights of all time – Diego “Chico” Corrales against José Luis Castillo on May 7, 2005. Corrales won the fight in spectacular comeback fashion – after being knocked down several times. I saw him days later and he looked like a cyclops. I just felt sick seeing that, and then later to know that he went out on his motorcycle after an argument with his wife, and ended up dead, all of that stuff – it made me sick. I’m talking literally – sick. Still, I stayed in the game a bit longer, handling promotion for Mike Tyson’s last fight on June 11, 2005, versus Kevin McBride in Washington, D.C. During that entire promotion, that feeling of disgust lingered when the difficulty of dealing with the people around Tyson reminded me how much peace I had when I wasn’t involved in the sport. It might also surprise many people to hear that a person who worked as a boxing promoter – someone who gained great wealth from the sport, who dined at the White House, had an audience with the pope, spent three precious days with Nelson Mandela and fed throngs of starving people – is so removed from the sport now that it sickens me to even watch two fighters walk into the ring. Last year sometime, I saw a three-minute clip of two ordinary fighters – they were just bangin’ on each other. I saw necks snapping back and it was like an avalanche of punches coming down. Like Tyson used to say: You go into the ring with bad intentions. The essence of the sport is about trying to hit somebody so hard on the chin that it short-circuits the brain and they get knocked out. That’s the goal. I don’t know if it’s me getting softer as I age or that I have a puppy that I carry everywhere, but I knew I no longer liked the sport and vowed to never pay for another fight or attend another fight. I don’t have any judgment about people who still love it. I’m just done – all the way done. There is a certain barbaric savagery that I can’t allow myself to be a supporter of ever again. Do I miss boxing? That answer is a 100 percent no. The one thing that emotionally strikes a nerve with me is whenever I hear Phil Collins’ song In the Air Tonight. That’s the song that Riddick walked into the ring on when he first fought for the title. When I hear [Phil sing], ‘And I been waiting for this moment for all my life’ – followed by the drums – oh, man. Those lyrics had a lot of personal meaning, and that’s from the ultimate Muhammad Ali fan, someone who sat with his dad and watched Floyd Patterson fight Ingemar Johansson. The song still gives me chills, but other than that, any attachment is gone. Boxing to me is like a relationship with a girl who came and went. I wish her well but have no interest whatsoever in her being involved in my life. I’m comfortable and satisfied. Am I bitter? Would I jump back in the ring right now if the second coming of Riddick Bowe were to come calling? Absolutely not. I am in a world far apart from that, and I’m very OK with that. I never thought of myself as a boxing person. I thought of myself as a businessman representing boxers and was hell-bent on not doing it the way the boxing fraternity said it had to be done. As a “boxing promoter,” I knew had to wear the mantle – but I was never comfortable being described as a boxing promoter. I made a commitment four years ago to use whatever influence I had to communicate a different narrative about black people, and I’m doing that with my TV show. At the beginning of each broadcast, I say, “I hope to inspire you with stories of extraordinary achievement.” That’s what I’m committed to doing. What motivates me now? Remembering that I grew up in a rural four-room house that did not have indoor plumbing until I was 16 years old and knowing that through hard work, I became something that my mother was proud of. One thing very important to me is that my life not end as a boxing guy. Now that I’m going into my fourth season of broadcasting, I think the Rock Newman narrative has changed – or is changing. Certainly, people are aware of my boxing past, but more and more people are telling me about the show – and about the stories we’re bringing about people. That’s very meaningful to me, and meaningful to me that I’m being redefined. I will say this about the sport: There was an unmistakable value that boxing had. It wasn’t just about the personalities. The biggest impact was that kids would come home from school and learn about discipline and about how to defend themselves without being aggressive. Kids found an outlet for their energy, and it helped so many boys become men. Boxing no longer does that for a new generation of kids, and that’s perhaps the saddest part. Former boxing promoter Rock Newman is the executive producer and host of The Rock Newman Show, which airs on WHUT-TV, a PBS station in the Washington, D.C., metro area and worldwide on the Rock Newman Show YouTube channel.